The Green Action Plan (GAP), adopted in July 2014, aims to help small and medium-sized enterprises (SMEs) take advantage of the opportunities offered by the transition to a green economy. circular economy’s potential for Productivity, Competitiveness and Business opportunities. the European Structural and Investment Funds. GAP aims at improving resource efficiency in SMEs with a view to both reducing production costs and increasing productivity gains. Better use of resources within the EU industry is expected to lead to an estimated overall savings of €630 billion per year. Relevant GAP activities focus on the provision of information, advice and support to SMEs, the facilitation of access to finance and the improvement of technology transfer mechanisms. The green economy transition process, including (among others) actions promoting resource efficient solutions and preventing environmental damage, offers a range of new business opportunities for enterprises opting to enter the environmental goods and services market. GAP strives to provide SMEs with an enabling business environment in which green ideas can be easily developed, financed and brought to the market. Relevant activities focus on the promotion of eco-innovation, including through eco-innovation clusters, and the facilitation of business partnering and of skills and knowledge exchange. Circular economy activities like re-manufacturing, repair, maintenance, recycling and eco-design, may become the new drivers of economic growth and job creation, alongside their key role in addressing environmental challenges. An enabling environment is once again crucial for SMEs and entrepreneurs to successfully engage in greener value chains. Relevant GAP activities focus on addressing barriers to green value chain collaboration, promoting new green business models, e.g. based on resource efficiency, the reuse of materials and/or waste, and supporting cross-sector cooperation for circular economy. Opportunities for European SMEs with green expertise to gain access to new markets have great potential to be further materialised, in line with the EU’s international commitments in areas such as climate change cooperation and neighbourhood policies. The fact that almost 9 out of 10 SMEs sell their green technologies, products or services in national markets only, is a clear indication of the need for a more supportive framework and more international cooperation, if EU SMEs are to be successfully integrated into global value chains. Relevant GAP activities focus on promoting a greener internal market, facilitating the uptake of green technology in partner countries, and enabling access to international markets. GAP has earned wide support by EU Member State administrations and SME stakeholders, including in consultations on the future of SME policy and in meetings with the Network of SME Envoys and business organisations. Governance ensures monitoring and updating of the actions supporting SMEs, as well as coordination, cooperation and best practices exchange at European, national and regional level. It involves a GAP Task Force, an Inter-Service Group, the Network of SME envoys, and the EcoAP High Level Working Group, with relevant activities being documented in the GAP implementation report. The Green Action Plan complements the Green Employment Initiative, which proposes a roadmap for supporting green jobs creation across the EU, and the Circular Economy Action Plan. European Standardization Organizations are encouraged to consider circular economy objectives in the creation of standards, thus continuing the European Commission’s previous efforts to integrate environmental aspects into European standardization. the establishment of European Strategic Cluster Partnerships (through the European Cluster Collaboration Platform) encouraging alliances between clusters from different sectors, including green technologies and eco-innovation, with a view to developing a joint strategy for internationalisation. the financial instruments under COSME, which support SMEs’ internationalisation by promoting their cross-border development. The Low Carbon Business Action provides technical assistance for the establishment of Cooperation Partnerships between EU businesses, clusters, businesses and other counterparts in middle income countries (match-making), and for the elaboration of joint bankable proposals. A new guidebook on "Improving Resource Efficiency in SMEs" (Volume 10 - Guidebook Series - How to support SME Policy from Structural Funds) has been published (September 2016). A Staff Working Document on "Best practices on Renewable Energy Self-consumption" has been presented (July 2015). The document examines saving potentials from self-consumption for residential and commercial users; underlines the role of self-consumption as a driver for flexibility in the electricity markets including storage; and identifies best practices concerning grid tariffs and support schemes. The internal technology transfer database of the Enterprise Europe Network has been revised in cooperation with EEN sector groups. The Access to finance portal has been updated and improved with information on how businesses can access the new EU financial instruments (2014-2020). The Portal includes direct links to the NCFF facility in each country. 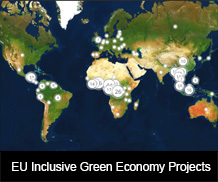 A Network of eco-innovation investment, called INNEON, has been established (June 2014), aiming to extend public and private funding sources available for eco-innovation and social innovation in Europe and provide a forum dedicated to the interaction between a select cohort of innovators and relevant investors. It has successfully attracted a considerable number of innovators/entrepreneurs and investors as active members and already closed successful deals. A new tool, the Environmental Technology Verification (ETV), has been established to help innovative environmental technologies reach the market, providing verification by qualified third parties (Verification Bodies) to claims about the performance of innovative environmental technologies. The European Environmental Citizen’s Organisation for Standardisation (ECOS) has been supported by the EC to represent environmental interest in standardisation activities of the European standardisation bodies. A European Cluster Collaboration Platform has been created, offering both virtual facilities (dynamic mapping of profiled cluster organisations worldwide; information on the European Strategic Cluster Partnerships; “marketplace” for exchange of offers and demands; “gateways” as organizations supporting SMEs internationalisation processes; profiled cluster-related projects developed under various European programmes) and live activities, like cluster matchmaking events to be organized in Europe and beyond.